Ismail has 30 years of working experience, having held several executive, management and senior management positions, including 15 years in education and training. 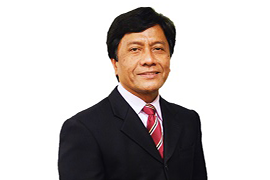 He started his career with the Technical Education Division, Ministry of Education, and Malaysia. He then joined a privately-run educational institution in Kuala Lumpur as a Principal. He was later appointed to be the Group Head of Human Resources and was directly responsible for training and development. Before becoming a full-time training consultant, Ismail served as the Central Human Resources Training Coordinator for Standard Chartered Bank Malaysia Bhd. As a trainer and consultant, Ismail has guided many of his course participants to tap their true potentials through his deliveries and workshops. He believes in sharing his personal aspirations and giving his best to help people fulfil their individual goals in their careers and personal lives. His warm personality and friendly, down-to-earth, common- sense approach has made his sessions well received by all participants. Ismail has a vast experience conducting various Oganisational, Management, Executive, Supervisory and Personal Development programmes for all levels of staff – from the Support Group and Front Liners to Senior Management in both the public and private sectors across the service and manufacturing industries. He was also the leading consultant responsible for carrying out training needs analysis for SMIs under the Pembangunan Sumber Manusia Berhad (PSMB) scheme. Ismail holds a Master in Business Administration in Total Quality Management from Newport University, USA and was initially trained in mechanical engineering in the United Kingdom and has received professional training in management and human capital development. He attended the Certificate in Training and Development course from the Institute of Administrative Management, U.K. and is a Certified Trainer with Pembangunan Sumber Manusia Bhd (PSMB).